Established in 1996, Property Plastering provides a wide range of high quality plastering and rendering services throughout Kent. We are a small, reputable, reliable plastering company growing fast on recommendation. Gary Gibbs owner of Property Plastering aims to provide a high quality, clean, punctual and friendly service to everyone they work for. We cater for all projects, large and small and take great pride in providing a reliable service. With free advice and quotations, we are your local plastering experts. We can both install new or remove old, unwanted artex. Established in 1996, Property Plastering provides a wide range of high quality plastering and rendering services throughout Kent. We are a small, reputable, reliable plastering company growing fast on recommendation. Gary Gibbs owner of Property Plastering aims to provide a high quality, clean, punctual and friendly service to everyone they work for. We cater for all projects, large and small and take great pride in providing a reliable service. With free advice and quotations, we are your local plastering experts. We take great pride in every aspect of our work and it’s really important to us that you are 100% happy with the work we complete for you. Over the years, our dedication to providing a quality service at a competitive price has earned us an enviable reputation based on referrals and repeat clientele. Helping you find the right trade or service. No other directory of tradespeople uses this model. 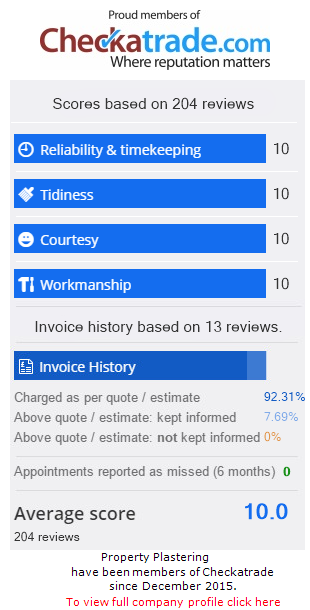 The background checks and public feedback ensure that only reliable and trusted tradespeople get work through Checkatrade. They make sure that you can find someone outstanding to get the job done. Property Plastering have been in this trade for a number of years you also get to meet other trades and we have built up a good list of quality tradesman so if your looking for a project to be carried out, maybe a new kitchen, bathroom, bedroom makeover we can supply other trades and take the hassle away from you having to search and even manage your project from start to finish to make the whole job run more smoothly and efficiently for you. We run a successful kitchen company and we use property plastering regularly to plaster the kitchens before we fit them. Our clients are very special to us and we would not consider using anyone else. They are an invaluable member of our team. I have used Property Plastering for a number of years now. Being a professional decorator you know the importance of good plastering work andI certainly have no complaints. They are always on the job when they say they will be and always leave the job clean and tidy. We are an established building company carrying out extensions, loft conversions etc. and we work solely on recommendation, so the quality of our finish is vital. Property Plastering continue to deliver a high calibre of work which leaves both us and our customers happy. Plasterer Services in Kent and South East London. Property Plastering has been established since 1998 and is a company growing fast by recommendation.